Today was a really good day. We started our misty rainy morning at Moerbrugge, where Geoff and Dave told us about the Lincoln and Welland Regiment’s disastrous attempt to cross the canal into the town. We talked about how optimistic a lot of people on the Allied side were about the German retreat, especially after Antwerp fell to the British. 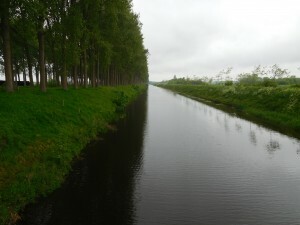 Moerbrugge was the first real proof that defeating the Germans in this area was not going to be the easy task higher officials thought it would be. There’s a really neat memorial to this event at the canal made out of an M10 carrier. 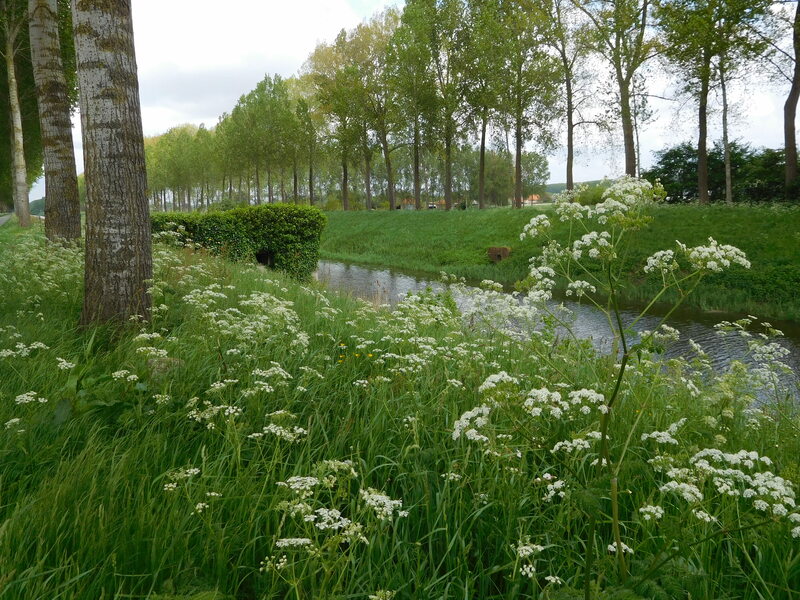 After Moerbrugge, we drove a short distance to the Leopold and Deprivation de la Lys canals, right outside the village of Moerkerke, where I delivered a short presentation on the efforts of the Algonquin Regiment to cross the canals and capture the German position. Very similar to the attempt at Moerbrugge, the Algonquin were unsuccessful and suffered heavy casualties. They were required to carry assault boats across dry land, launch them across one canal, carry them up an embankment and across land to the second canal, and cross again. All while under fire, of course. Again, this was further proof that the Germans were not about to hand over their strong points in Belgium and be chased in their retreat. Moerkerke is also an example of the discrepancies taking place between the goals of the military commanders and their men on the ground. The soldiers of the Algonquin knew how insane this crossing attempt was in reality, but went along with it because it was part of the “larger picture” envisioned by those above them. The outcome of this event was tragic, with 28 of the Algonquin killed, 40 wounded, and 66 taken prisoner. The Algonquin would continue fighting throughout the war, participating in other actions in the Scheldt. It was an honour to tell part of their story and chilling to do it on the very spot where many of them fell. Once my presentation was over, we drove to the Canada-Poland Museum in Adegem. The building and grounds are an interesting amalgam of museum, restaurant, dance school, and Japanese gardens, all run by an incredibly enthusiastic gentleman called Gilbert Van Landschoot. Gilbert told us about his father’s efforts at hiding people from the Gestapo during the Second World War and his immense gratitude towards the Canadian and Polish forces who liberated the country. He took us into his workshop and showed us the new exhibit he’s working on, explaining that many of the buildings on his scale models of battlefields he hand-crafts himself. His collection consists of donated items and items that he has been able to purchase over the years, including many of the regimental badges of the Canadian Army. Gilbert was a pretty entertaining guy and our visit was really enjoyable. He was sure to give us all pieces of chocolate as well, explaining that the Canadian soldiers handed it out to liberated Dutch and Belgian children. It was a very heartfelt and gracious exchange. After saying our goodbyes to Gilbert, we headed back out towards the Leopold Canal (further down from Moerkerke this time), where Sébastien told us about the crossing of the canal and Operation Switchback. He provided a lot of context to this discussion, touching on the issues of supplies, technology, and battle fatigue. He also outlined the four major phases of Switchback and examined their outcomes. We finished off our day at Adegem Cemetery. This was our first Second World War Cemetery and our first Canadian designated war cemetery (in contrast to the Commonwealth cemeteries we had previously visited). For me, this visit turned into one of the most emotional yet. While walking along the second row of graves I came across Private R.J. Lacombe from the Algonquin Regiment who was killed in action at Moerkerke on 14 September, 1944 – the battle I had just talked about that morning. 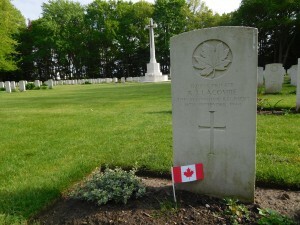 My heart sunk a little as I quietly gave Private Lacombe my thanks for his service and planted a Canadian flag next to his grave marker. I was so sad for him, yet immensely proud of his bravery in such an impossible task. This was probably the first time the reality of it all hit me. As I continued down Private Lacombe’s row, I found more and more members of the Algonquin Regiment and my heart sank lower and lower. I don’t have a personal relation to any of them, I don’t recognize their names, but I felt connected to them still. I had just been talking about these men and now I was looking at their gravestones lined up one after one in the cemetery. It was heartbreaking. Adegem Cemetery continued to test my emotions when it was pointed out to me that there were members of the Essex Scottish Regiment laid to rest there as well, the regiment from my hometown. As I read the names one immediately stood out – Sergeant E.E. Rivait, a relative of the soldier I’ve chosen to present on during this trip. The Rivait family of Windsor was a large one, so I initially thought this was one of my soldier Lawrence’s brothers (Lawrence came from a family of 12 children and he had a brother named Edward who served with the Essex Scottish during the Second World War), but it turns out that Sergeant E.E. Rivait was actually a cousin of his. Nonetheless, seeing that last name and associating it not only with home but with this soldier that I’ve come to research and know considerably was also emotional. All of this has just reiterated in my mind how important it is to remember the individuals in the wider context of the World Wars. The numbers and statistics were real people; they had names and families and loved ones who were devastated by their passing. 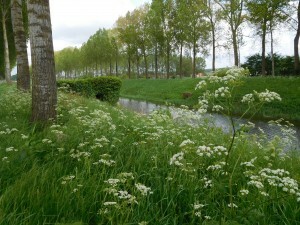 Adegem served as a striking reminder as to why I wanted to participate in the battlefield tour in the first place. I’m now more proud than ever to be able to learn about and share these stories with others.